The rally over, David Brock glowed like the post-sunset sky as he explained the true grassroots nature of the action. "There were no real leaders," he told me. 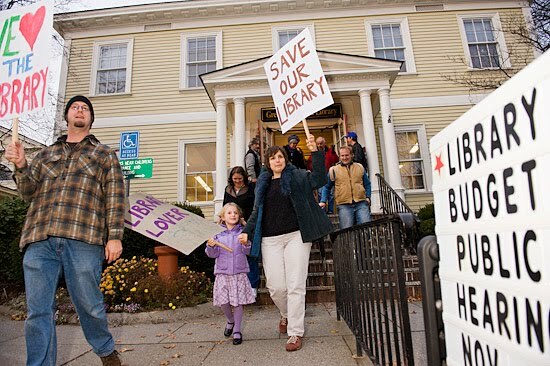 A couple of weeks ago, Mr. Brock had been talking with fellow Greenfield, Massachusetts resident Garth Shaneyfelt about the proposed library budget cuts and they decided: "Let's have a march." Mr. Shaneyfelt made an event on Facebook and it just went from there. 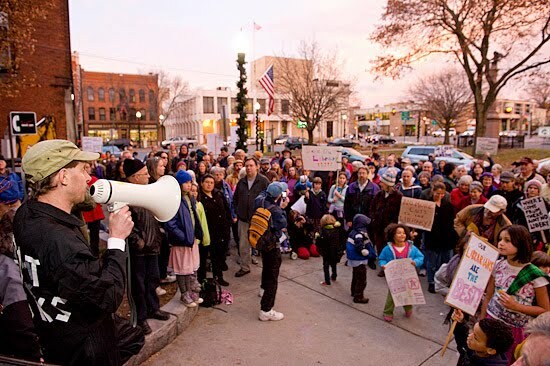 Using a bullhorn, Mr. Shaneyfelt addressed the roughly two hundred protesters. 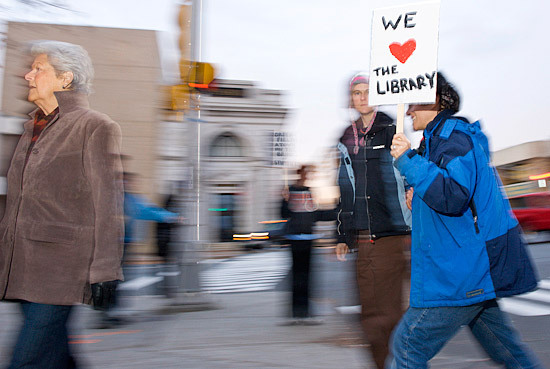 The group had marched down Main Street and through the Greenfield Public Library before rallying in front of City Hall. 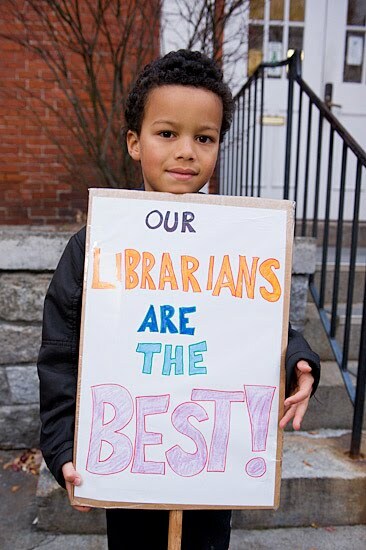 The librarians greeted the marchers with waves, and collected donations. The proposed cuts will result in staff layoffs, reduced hours of operation and put the library's certification in question. 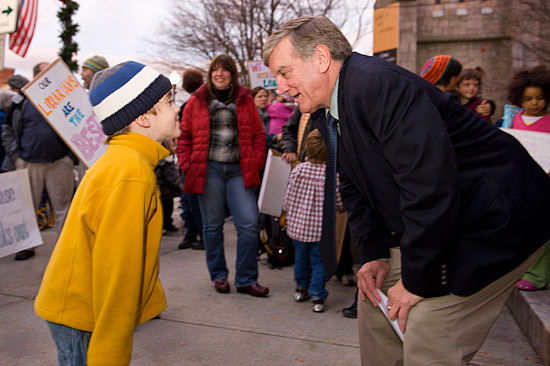 Five-year-old Theo Papachristos urged Greenfield Mayor William Martin to: "Save our library!" Mayor Martin told the crowd that all town departments are being cut. A librarian explained to me that her institution's certification is in jeopardy because the library's cuts are proportionally larger than other town services. 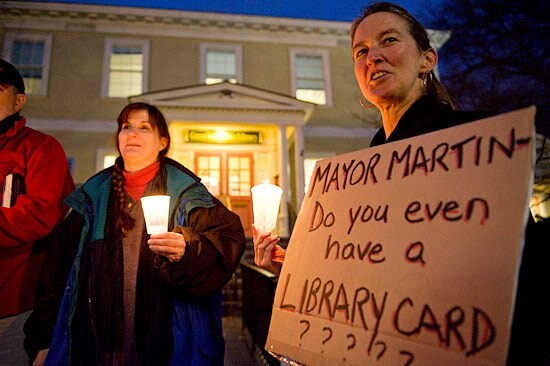 The Library Lovers collected signatures asking the town council to talk with Mayor Martin about ways to move through these tough times without cutting the library's budget. "We (the town) have the rainy day fund," Mr. Shaneyfelt told me, "and it's monsoon season in America, as they say." The protesters held a candlelight vigil outside the library after the march and rally. 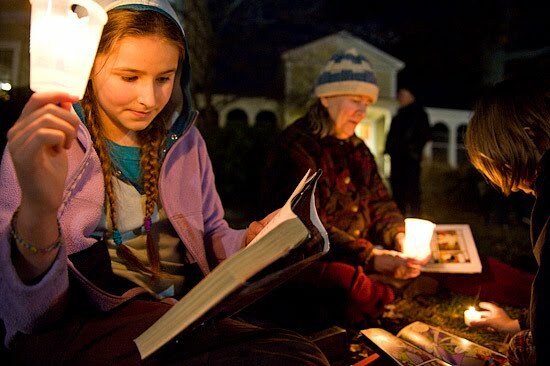 12-year-old Rose Jackson Fairest read outside by candlelight (talk about symbolism!). 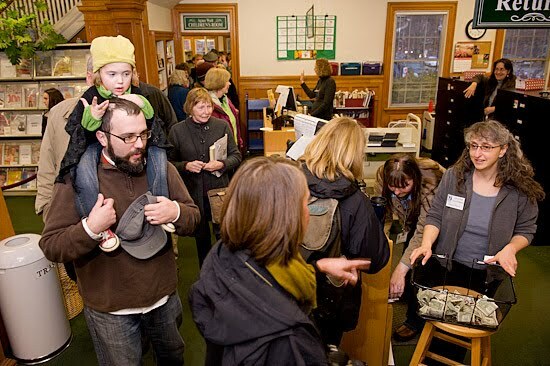 "It's amazing to see that so many people care about the library. I've never been to any march like this. I'm very glad I came. It felt really good to support the library. It's one of my favorite places." My purpose for covering the event was at least threefold. 1. Some of the images will be available for licensing at The Image Works, my editorial stock agency. 2. I will soon be teaching a class about event photography and wanted to show some fresh examples. I assign my students six different approaches for thorough coverage. The categories are noted beneath each image. 3. 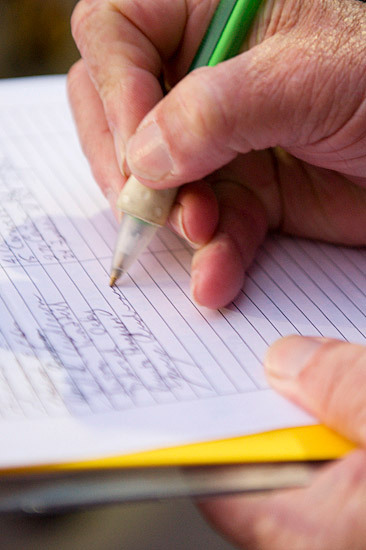 I love documenting people taking a stand.